Apples covered with caramel are a delicious fall treat. This guide is about making caramel apples. 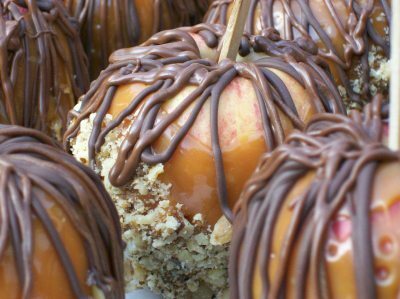 I make a lot of caramel apples dipped in chocolate. My problem is that the chocolate will crack and sometimes the cracks are quite large. After I put the caramel on, I put in the frig to harden, then dip in chocolate. Then I put back in the frig to set the chocolate. Can any one tell me how to stop the cracking? What am I doing wrong? I use Peter's brand of caramel and candy melts (wafers) for the chocolate. Try cooling the apples at room temperature. They may be cooling too fast. In most recipe using dipping chocolate they use shortening in the chocolate. Might try a tablespoon of shortening in the chocolate. Also like Ann said keep the apple at room temperature. Thank yous for the feedback. I will use these suggestions. 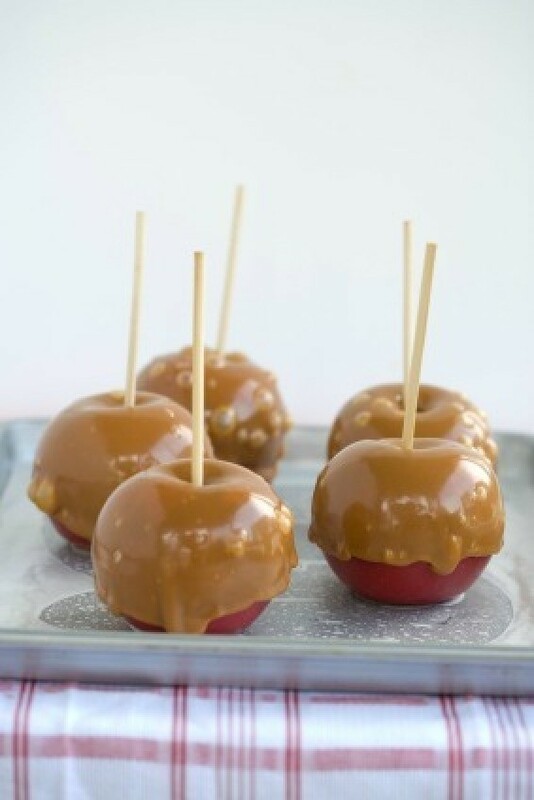 I am going to make caramel apples for the first time so I would like some tips on what to do. Any shortcuts that you learned from making the apples or tips for cleaning up? The easy way, some stores sell caramelle apples kits (for lack of a better word) Small squares of caramelle that fit over one apple each. The kit also comes with sticks to push in the apples. I used the individually wrapped Kraft caramels and I think the recipe is on the package. Be sure to grease your waxed paper or foil that you put the apples on after they are dipped. I learned the hard way. Mine stuck to the paper and it was very hard to remove. I melted some milk chocolate and white chocolate chips and drizzled over the caramel after the caramel set up. The apples looked like the gourmet apples you purchase at specialty stores. It was a lot of fun. Good luck. HI Robb. As Mel mentioned about the dipped apples sticking to the paper, Parchment paper works without the grease. I just made 24 caramel apples for a fall themed baby shower which turned out so cute. I made some with ground walnuts and drizzles of dark and milk chocolate. Then some with just the drizzles of chocolate. One tip would be if applying walnuts, apply them as soon as you are done dipping so the nuts will stick. Also just after dipping, use a rubber spatcula to scrap off the excess on the bottom of the apple so it doesn't puddle when you place it on the parchment. I used the microwave directions and had a great out come. I would dip two apples and then I would zap it again, then dip the last few. Soaking the bowl in hot water for easy clean up! Have Fun!